Path MEGAzine > News > World News > What Did Aretha Franklin Hand Over to Pope Francis? 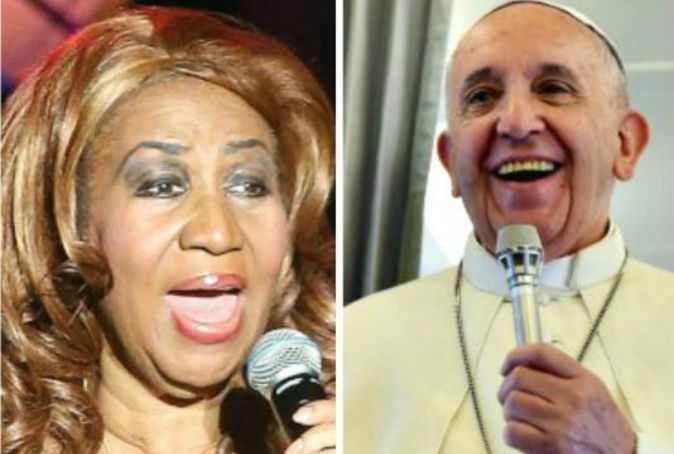 What Did Aretha Franklin Hand Over to Pope Francis? Preacher’s kid and soul music legend Aretha Franklin got the opportunity to meet and even handoff of something to Pope Francis during his first visit to the United States. This entry was posted in World News and tagged Aretha Franklin, Pope Francis, Rev. C.L. Franklin, United States by Kris Patrick. Bookmark the permalink.